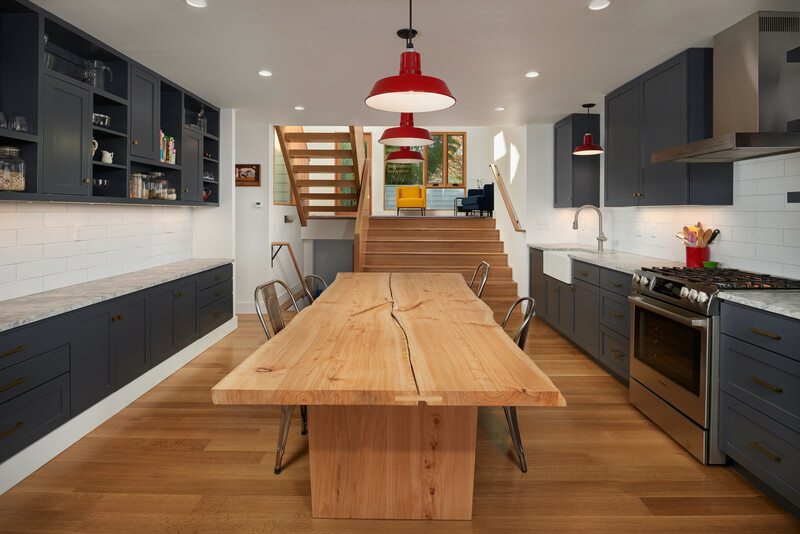 When the owners of a narrow lot in a single dwelling urban neighborhood in North Portland asked MWA to design their dream home, we were excited by the possibilities despite the restrictions of the site. 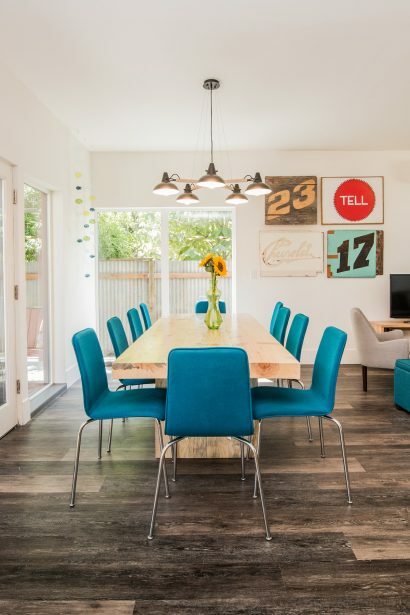 The owners wanted a house that was modern, filled with natural light, provided separation of spaces for living, yoga, relaxation, eating, and work space – all on a NARROW (25’ wide) lot. Existing 25′ site with garage. Cedar tree in back of lot was milled into the new dining table. For some historical context, in Portland, and in the design community, the mention of “skinny houses” can evoke a hostile reaction. To be fair, many of the first designs to be built were considered to be out of proportion for their lots and featured low quality materials. Indeed, there have been calls to ban these houses based on the community’s reaction to them. 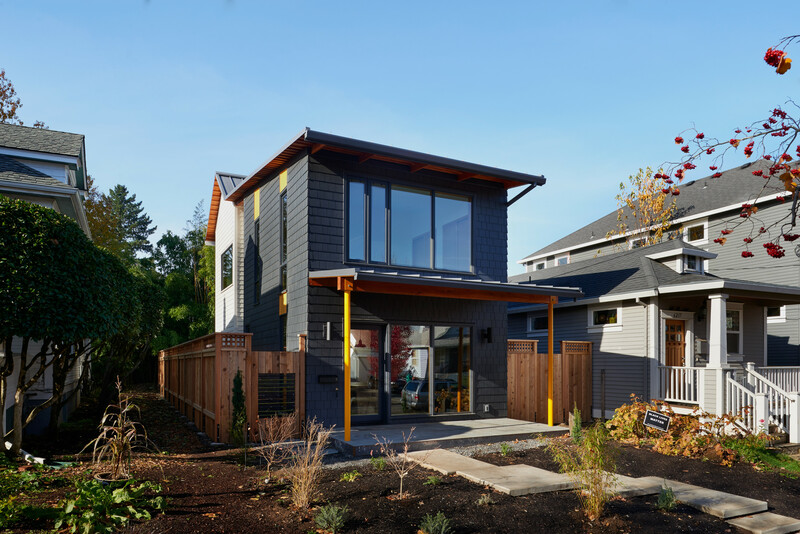 In 2004, the City of Portland unveiled the results of a “skinny house” design competition which was a booklet of design standards, “Portland’s Narrow Lots & Skinny Lots” and featured two “permit-ready” skinny house designs that were not well received in Portland. It generally appeared that people did not want these homes in their neighborhoods. Examples of skinny houses built in Portland. These houses are often out of proportion because the height limit forces a long, extruded form in order to fit three bedrooms on a site. Narrow houses have a height limit of 1.5 x the width, which on a 25’ wide lot limits the height to 24’. Setbacks of 5’ from each side property line are required which dictates a maximum 15’ width on a 24′ lot. In our case we started with a 26’ wide lot allowing this house to be 16’ wide. The code also requires a roof overhang to fit into existing neighborhoods, thereby discouraging a more modern flat roof. It was against this backdrop of perception and code restrictions, that we endeavored to design a home that would take a fresh look at this narrow lot typology. Often constraints make us work hard to come up with creative solutions that seem elusive if not impossible given the parameters. However, with a different mindset, it can happen that the limitations present possibilities of their own. Our design worked with the code and site limits by creating a split-level plan using half-level floor changes to create differentiation between rooms instead of walls. 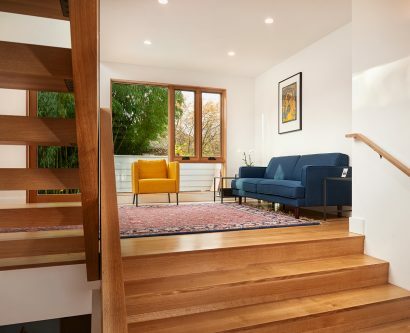 Knowing what the owner wanted and what the code required, we arrived at a design for a narrow house that split the house into two forms and offset the floor levels with a social open stair in between. By utilizing a split level, we were able to engage the street and neighborhood at ground level but gain the third bedroom with a half basement in the back. 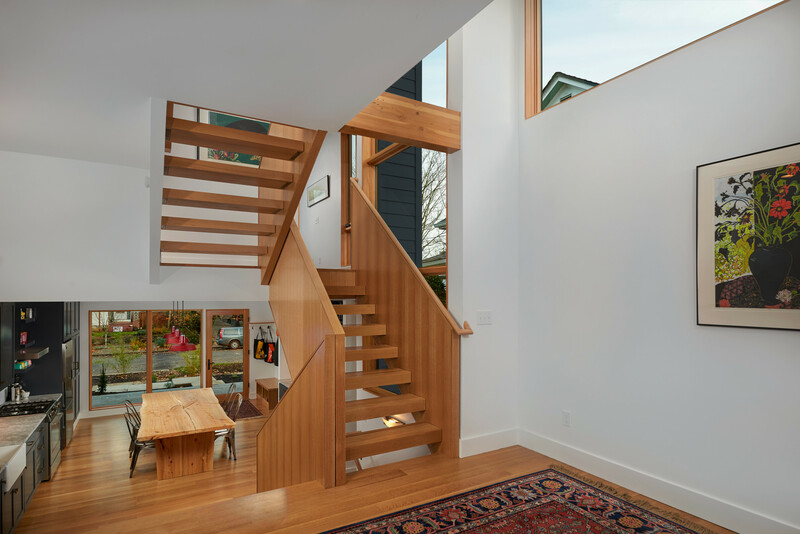 These two forms also create dynamic spaces experienced as you move through the house and allow natural light to flow in from all directions. The new dining table was milled from the cedar tree in the back of the lot. The exterior expression avoids the long extruded form with the split massing. Playful roof forms with slim roof lines meet the code requirement for eaves but with a modern expression. Ultimately, the Slim House was able to work within the limitations to become a modern home that provides the owners with a variety of light filled living spaces, plays well with its neighbors, and demonstrates an elegant design response to the restrictions of a narrow lot. Upon completion, the owners told us that they never knew a house could be more than just walls and windows, but actually an inspirational space. 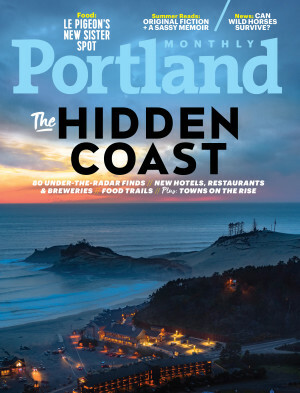 Slim House was featured in Portland Monthly Magazine. Check out the article!